I've been a devoted fan of capsule wardrobes for a few years now, and I love the minimalistic simplicity it brings to my life. I enjoy fashion, but in my early days as a style blogger (circa 2011 - 2015) I had a tendency to accumulate so much clothing that it made my head spin when trying to decide what to wear. Most of it was thrifted or purchased on sale, but it was still in excess and made things so much more complicated than they needed to be. I found out about capsule wardrobes through a friend who posted Courtney Carver's Project 333 blog and that was all it took. I sorted my closet that same weekend and narrowed my clothing down to 33 key pieces. Now I only have 24 - not including shoes, underwear and workout clothing/pajamas. When we moved to California, I downsized more because I no longer needed half of my wardrobe - things like heavy coats, thick sweaters and scarves, as well as many of the long-sleeved tops I owned. I passed some on to friends, sold the rest in a yard sale, and donated what was left. The seasonal changes are very *gentle* here in SoCal, with temperature fluctuations usually hovering around 20 degrees of difference from day to evening, so light layers are the order of the day. If we're going to the beach, we might pack hoodies or a light jacket, but that's really the maximum warmth you need here, even in the heart of winter. All that being said, there is a lot more rotation of the same clothing from season to season for me here. California style, in general, is more relaxed and casual. The preppy look I used to be fond of in the Midwest just seems fussy here, so I've embraced the bohemian style fully. I've recently lost over 30 pounds, so it was time for some updating to the wardrobe. I added a few pieces from Target and from my favorite local boutique, Nadya's Closet. I decided my palette for spring/summer was going to be a range of neutrals with pops of coral and pink. Our midcentury bungalow is half the size of our house in Missouri, and I love it. I've always said I would be a happy tiny house owner, and while 1200' isn't technically tiny, it's plenty of room for us. Less space means smaller closets and needing to get a little creative with storage, though. 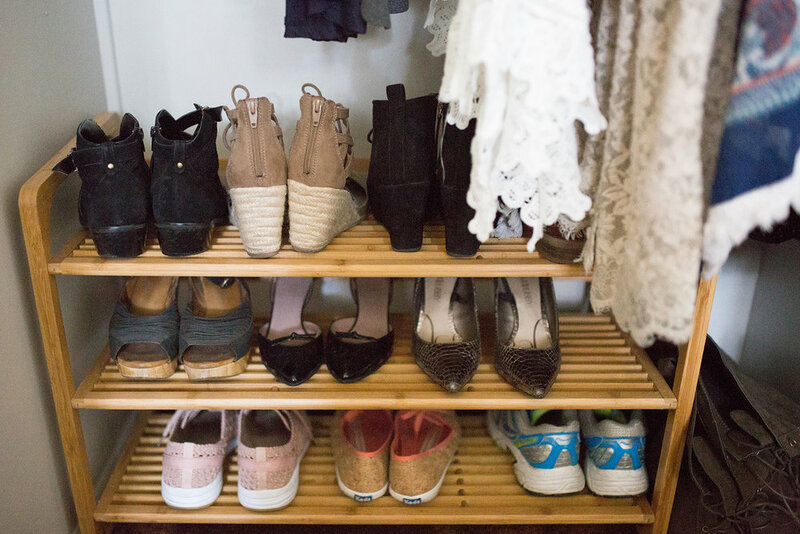 My husband has the bigger closet, because -shocker- he has more clothing and shoes than I do with working a corporate job and needing more of a diverse wardrobe. I made the most of my small closet by adding cup hooks to hang my necklaces, and collapsible boxes for my workout clothes and pajamas instead of having a bulky dresser in this tiny 10x10 room. I decided not to put the closet doors back on my closet. Because it is so small and curated, I really do enjoy looking at it. These are truly all the shoes I own. Anyone who knew me way back when knows this is amazing! There's also is a pair of hiking boots hiding behind that white tunic - very much a necessity for living in beautiful outdoorsy California. How about you? Do you love having lots of clothing choices, or more of a curated collection?